After creating one or more cubes, you typically create and package a set of initial pivot tables and dashboards, and users typically create new pivot tables and dashboards as needed. For much more information on creating pivot tables and dashboards, see Using the DeepSee Analyzer and Creating DeepSee Dashboards. 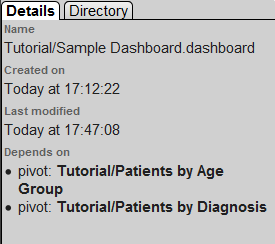 Earlier in this tutorial, we created a pivot table that uses the Patients cube. Now let us create pivot tables that use your new cube. Navigate to the Tutorial cube. Drag Age Bucket to Rows and drop it onto the Breakout Here button . Drag and drop Count to Columns. Drag and drop All Patients to Rows, at the bottom. Save the pivot table and give it a name. Here, we are saving the underlying query that retrieves the data, along with the information needed to display it the way you chose. We are not saving the data. In this section we create a simple dashboard. Click the DeepSee link at the top of the page. The system then displays the User Portal, which lists the existing public dashboards and pivot tables. Notice the > button on the left side of the dashboard. 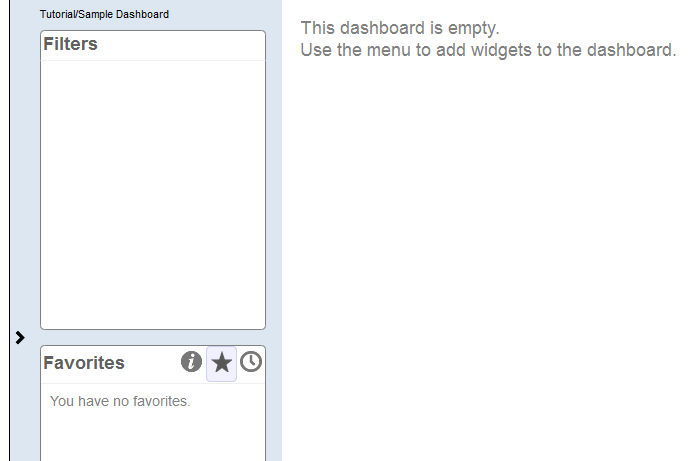 This step displays a list of any widgets that this dashboard currently contains (none in this case). This step displays a dialog box where you can choose some initial options. In the dialog box, click Pivots and Charts, if this is not already expanded. The list expands to show a list of choices. In this list, click Table. Click the Search button next to Data source. Repeat the preceding steps to add the other pivot table that you created in the previous section. The newly added widget is placed in the same default position (in the upper left) and therefore covers the previously added widget. Put the cursor into the title bar of the newly added widget and then drag this widget and drop it below the other widget. You might want to leave space below the upper widget so that you can resize it. Use the resize control in the lower right corner of each widget to resize it so that all rows are visible without scrolling. 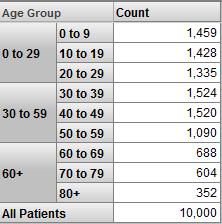 Click the Patients by Age Group widget. The Dashboard Editor displays a list (currently empty) of any controls defined on the selected widget. Click the plus sign button above the list. For Action, select Apply Filter. Repeat the preceding steps to add the Allergies and Favorite Color filters. 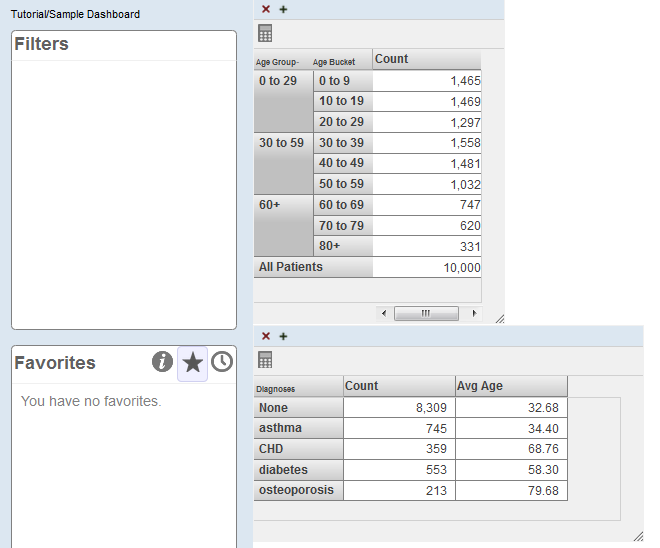 Access the definition of the Patients by Age Group widget. Click the ZIP Code control. For Default Value, type 32007 and click the check mark. As you make these changes, the system automatically saves them. If you use the browser’s refresh button, each filter should show the correct default value. Each filter should affect both widgets. Click Menu > Management Portal. 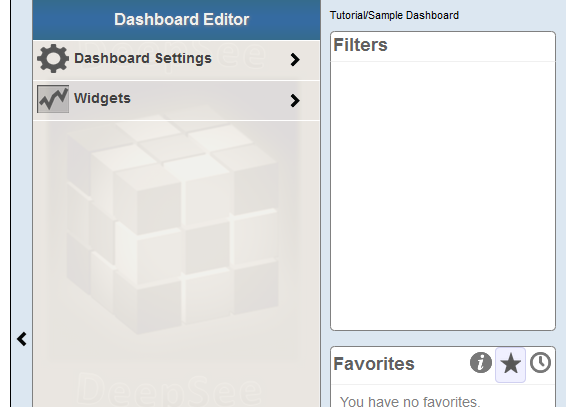 If you do not see this option, you are currently logged in as a user without direct access to the DeepSee development tools. In this case, log in again to DeepSee as described earlier in this book. Click DeepSee > Admin > Folder Manager. The system then displays the Folder Manager. The column on the right indicates the Caché user who created these items; you may see different values there. Both of these pivot tables are in the same folder as the dashboard itself, which is not required. Click the check box to the left of the two newer pivot tables as well. For Directory, type the name of an existing directory to which you have write permission. The system then writes three files to that directory. You could use these files as a package for the items you have defined, but in the next set of steps, we will use a more convenient approach. In Studio, create a new class called Tutorial.DashboardsAndPivots. The class should extend %DeepSee.UserLibrary.Container. Copy the contents of this file, starting with the second line and ending at the end of the file. That is, do not copy the first line, which is the XML declaration. Use a text editor to open one of the pivot table files, which has a similar structure (with <pivot> instead of <dashboard>). Copy the contents of this file, , starting with the second line and ending at the end of the file. You could instead insert the copied text between <items> and <dashboard>. The order of the items has no effect on anything. Repeat the preceding steps with the other pivot table file. Return to the Folder Manager and refresh the page. This clears any selections you may have made. Click the check box next to each of the three items in the Tutorial folder. Click Delete and then click OK to confirm. In Studio, compile the class you just created. When you do this, the system imports the dashboard and pivot table definitions contained in that class. Return to the Folder Manager and refresh the page. 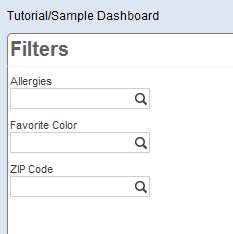 Notice that the tutorial dashboard and pivot tables are available again. You can include as many dashboards and pivot tables as needed in a container class like this, and you can have multiple container classes. There are no requirements to organize the dashboards and pivot tables in any particular way in these container classes. 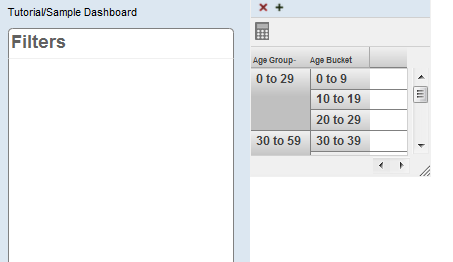 For example, you do not need to place the pivot tables in the same container class as the dashboards that use them. There is also no requirement to create these container classes at all.